Electric motors convert electric current into a rotational torque. They are the most common electro-mechanical actuator in cars and trucks. Virtually every pump, fan and positioner in an automobile employs an electric motor. A typical automobile has about 25 electric motors and this number is growing with each new model year . Luxury vehicles can have more than 100 motors. These motors cover a wide range of sizes and power; from the tiny stepper motors that set the position of the indicators in "analog" gauges (operating at milliwatts) to the starter motor in cars with internal combustion engines (kilowatts) or the electric drives in an electric or hybrid electric vehicle (hundreds of kilowatts). AC motors in automobiles can be single-phase or three-phase. Since the power supply in an automobile is typically a DC supply (e.g. a battery), motors that are not DC brushed motors require some type of power inverter to change the DC supply current to a form suitable for driving the motor. Motors that have a controller that uses feedback from position sensors to fix the angle of the rotor are called servo motors. 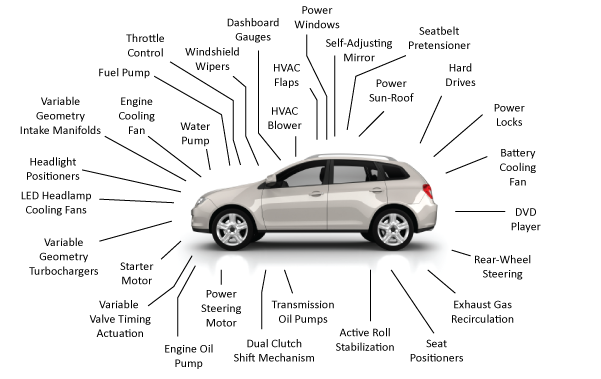 More Motors, Especially Brushless, The Hansen Report on Automotive Electronics, April 2012.